Please note that the content of this book primarily consists of articles available from Wikipedia or other free sources online. 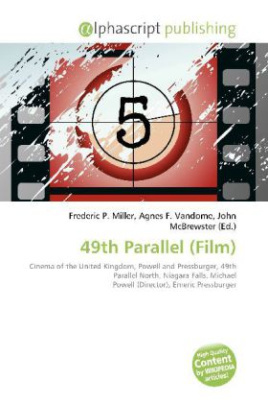 49th Parallel is the third film made by the British writer-director team of Michael Powell and Emeric Pressburger. It was released in the United States as The Invaders. Despite the title, no scene in the movie is set at the 49th parallel, which forms much of the U.S.-Canadian border. The only border scene is at Niagara Falls, which is located farther south. The British Ministry of Information approached Michael Powell to make a propaganda film for them, suggesting he make "a film about mine-sweeping." Instead, Powell decided to make a different film to help sway opinions in the still-neutral United States. Said Powell, "I hoped it might scare the pants off the Americans. Screenwriter Emeric Pressburger remarked, "Goebbels considered himself an expert on propaganda, but I thought I''d show him a thing or two." After persuading the British and Canadian governments, Powell started location filming in 1940.